Gower was the UK's first Area of Outstanding Natural Beauty, and we clearly saw why on our next walk around the sensationally scenic Three Cliffs Bay and on up to Pennard Castle. Then the following day we rounded off our holiday visit to Gower wonderfully with another visit to the dramatic Rhossili coastline and a walk around Worm's Head to Mewslade Bay. Following a rather wet start on the fifth day of our Gower holiday we ventured out to walk around Three Cliffs Bay and kept stopping to admire the breathtakingly appealing views of the coastline! ...informed us that the wind had eroded the sand around this seat which is why Belinda looks like she's sitting on a giant's chair! 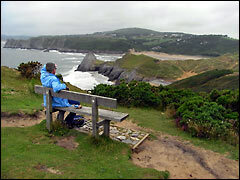 No worry though with a stunning view like that of Three Cliffs Bay! 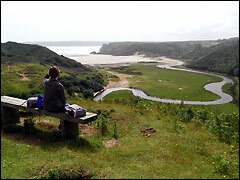 ...we were rewarded for our seriously strenuous climb when we found another wonderful viewpoint to rest awhile and look back and admire Pennard Pill snaking along to its outlet at Three Cliffs Bay. 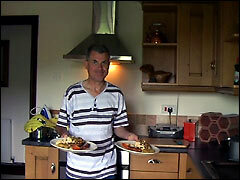 ...during our Gower holiday and each time enjoyed a deliciously yummy meal. 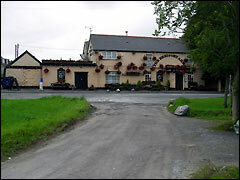 We've posted our positive experience on beerintheevening.com. Next morning Mike cooked breakfast with all the trimmings! 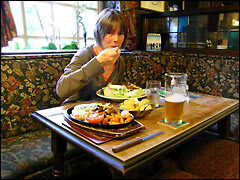 A hearty breakfast, yes, was just what we needed before another day's scenic Gower walking. 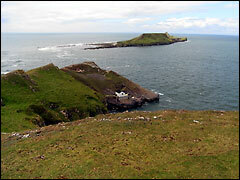 On our last day in Gower we returned to Rhossili, this time to explore the picturesque coastline around Worm's Head. 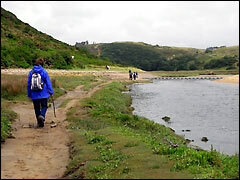 The area is famed for its abundance of wildlife and is a popular spot for birdwatchers. 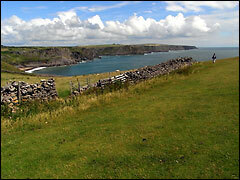 Unfortunately the tide was in so we couldn't walk across to Worm's Head, but at least the weather was favourable. 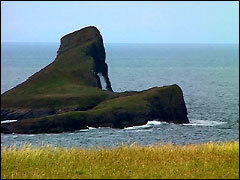 Locally known as 'The Worm', it was originally called 'The Wurme' by Viking invaders. This close-up of Worm's Head is actually a grab from our video footage, capturing the famous blow hole at the moment the sea crashed dramatically through it. 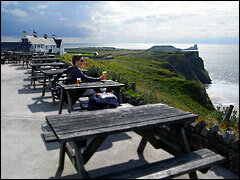 Now that has got to be one stunning coastal view; well, it swept us away (not literally!) 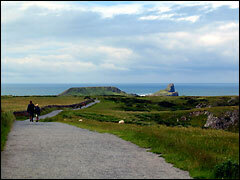 as we walked around the Rhossili headland in Gower. Time to stop then and take in the spectacular scenery. 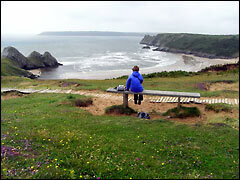 Here we admired the view towards Fall Bay and, beyond, Mewslade Bay. 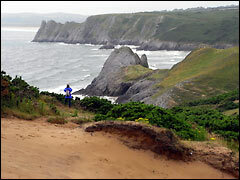 And we enjoyed many simply wonderful views like this all along the Gower coastline. 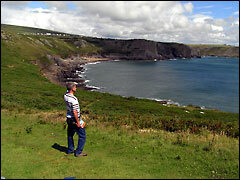 For further Gower study please check out our UK tourist resources. 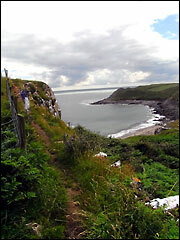 Fall Bay here from further around the coast. Can you spot Belinda up on that narrow path to the left? ...we refreshed with a pint in the pub and savoured our final coastal view from the beer garden over lovely Rhossili Bay before returning to the Gower holiday cottage and sadly, next day, home. 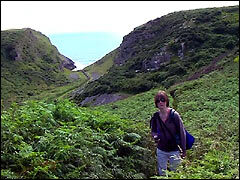 Check out other coastal walks we've done in Devon, Dorset and the far west of Cornwall.